1922 wasn't Winston Churchill's finest hour. He lost his seat in Parliament after a distinguished political career and suddenly found himself with plenty of time on his hands. The perfect year, then, to snap up a Victorian country manor house in the Kentish hills near Westerham. 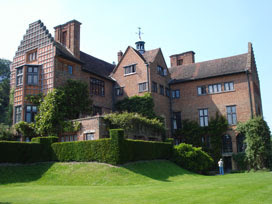 Chartwell Manor cost £5000 to buy (a fortune in those days) and another £18K for the architect Philip Tilden to rebuild. A delightful gabled family home emerged, with landscaped grounds sweeping down to two artificial lakes. Winston moved in at the age of fifty and lived here with his beloved wife Clementine for most of the next four decades. There was a financial hiccup in 1945 when the British population voted him out of office again, but friends ganged together to buy the property and donated it to the National Trust (with the Churchills as tenants on a nominal rent). And that's why there's now a car park at the head of the valley, and a tea shop, and a plant stall, and a queue of coaches disgorging a steady stream of mature visitors. Me, I arrived by bus. Chartwell's grounds aren't enormous, but they are splendid. The house clings to one side of a narrow wooded valley, with distant views across the undulating Weald from a series of grassy terraces . 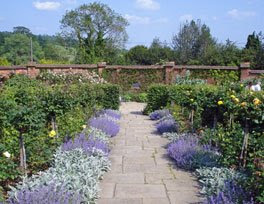 A rather charming rose walk crosses the kitchen garden, planted to commemorate the couple's 50th wedding anniversary 50 years ago . There's a formal rose garden, an informal water garden and of course a pristine croquet lawn . It's all very Lutyens-Jekyll. Winston also grew his own vegetables (nice patch, Winnie), built his own walls (a plaque points out which), and indulged his love of painting in a garden studio (was there no end to this man's talents?). Access to the main house is via timed ticket. Chartwell's a lot more cramped on the inside than it appears on the outside, so the volunteer stewards don't want everyone storming in at once. A visitors book in the hall records the names of civil dignitaries and world statesmen who popped by, with an original telephone resting nearby (Westerham 3344, if you ever fancy giving the great man a call). Many of the shelves in the compact library are filled with Winston's own books, written upstairs in the wood-panelled study. Even the disabled can get up to the first floor via the tiny lift installed for Mr Churchill's 80th birthday. Do stop to talk to the stewards, they have many fascinating tales to tell. See that fish tank. The story goes that two schoolboys won a pair of goldfish at a central London funfair after the war, and walked up to the door of 10 Downing Street to present them to Mr Churchill. "We thinks you deserves them for saving our country Sir," they said (or something similarly endearing). Winston asked a member of his staff to rush out and buy a fishtank, and then took an interest in fish-keeping from that day on. Oh, and if you listen carefully you'll hear it's a silent fishtank, he couldn't bear even a low electric hum. Watch out for the trademark cigars all over the house, and several framed examples of Winston's finer brushwork. Look, even the wartime Prime Minister had his own ration book. And there's his Nobel Prize for Literature, and his certificate of honorary American citizenship, and blimey Churchill was a bit of a superman really, wasn't he? Right man, right place, right time. Having visited Chartwell I can now also picture him as a family man, sat at the circular table in his low-ceilinged dining room, gazing out through the arched windows at the Westerham hills. Who wouldn't have been happy here ?